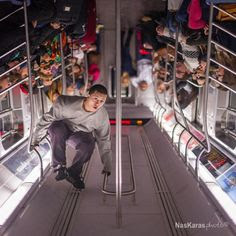 As I stumble upon a train, When I enter on an 8th Avenue local stop, I see some upcoming dancers introducing themselves, As they started to perform straight to the top. Doing tricks and flips like I've never ever seen, It became a social media phenomenon, As I scroll upon my Instagram, As these dancers came and show their stuff. Many dancers were moving to the body, To the music that they were shaking to, No distraction from them other train passengers, Listening to the sound of wherever the music was playing from. They Started to get warm up, Get ready to burn up, When they turn up the sound to their speakers, They made some room to make some clear space. One, Two, Three all eyes are on them, Many of the moves that I see, They already practice for themselves, As They listen to the sound of the rhythm.